A serious crash between a transport truck and a passenger vehicle has left a 65 year old Kitchener man dead. 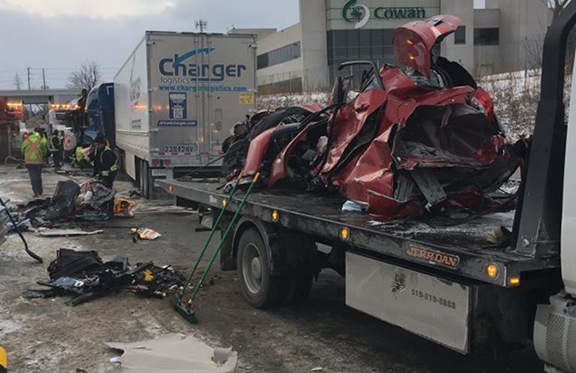 The crash occurred in the off-ramp lane to Highway 8 around 11:30 a.m. Friday, closing the westbound lanes on Highway 401 at Highway 24. The passenger vehicle was completely destroyed. Initially police had reported that there were serious injuries, however, just before 1pm police confirmed that the man in the passenger vehicle had died of his injuries. The driver of the transport truck was taken to hospital with minor injuries. “Somehow that car got in front of the transport truck, and the transport truck at some point went up over top of the car,” explained Sgt. Kerry Schmidt with the OPP. There were significant delays in both directions as eastbound traffic slowed to observe the crash scene as they passed by. The 401 corridor between Townline Road and Homer Watson continues to be a deadly area as drivers of all vehicles refuse to reduce speed as they pass through or come and go from the Region. There was no word at this point as to the cause of the collision, but police say they are considering all possibilities.